Gov. Jay Inslee just appeared on teh Chris Haywes Show on MSNBC and, in response to Hayes’ question, said he “can’t” veto the bill exempting legislators from the state’s Public Records Act. Gov. 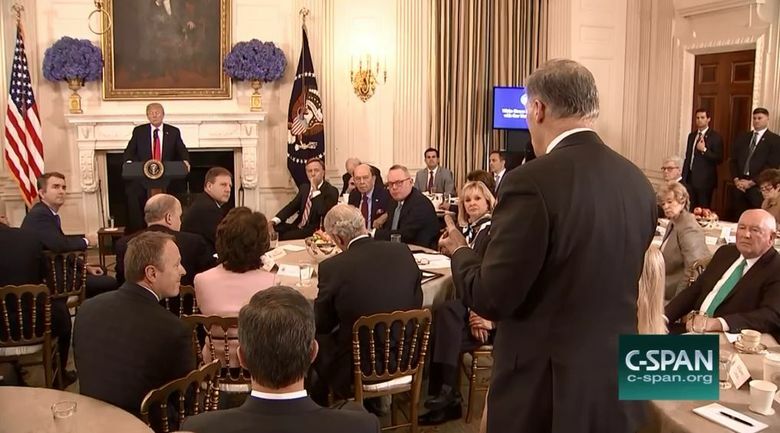 Jay Inslee stood up to President Trump today. He needs to stand up to the Legislature and veto the bill exempting the legislators from the Public Records Act. Photo via Seattle Times. Why? because, he says, the bill was passed with a veto-proof margin. Go ahead and veto it anyway, Governor. You today stood up to President Donald Trump (which is what got you on the Chris Hayes Show in the first place). Stand up to the Legislature. Make them vote a second time if they want to override your veto. Inslee’s email can be filled out here. Send him an email to do the right thing. Why am I not surprised; just disgusted in our elected officials. Thank you again for keeping us informed. I sent mail to Inslee and to Rodne and the 41st district reps. Shame on the legislature. How can they even get away with this?